"I started cryotherapy in May after receiving news at a doctors appointment that I had two extruding disc in my back. I was told that surgery or a steroid injection would be the only way to calm the inflammation down. 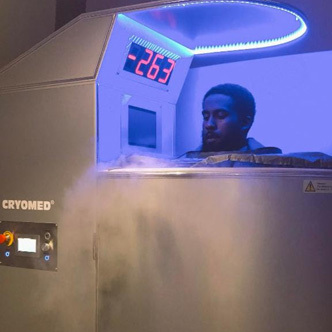 I had traveled to France earlier this year for work, and did cryotherapy which helped me tremendously, but I had not done it since I returned home. I decided to give it a try, instead of the options my doctor gave me, and it worked better than I could imagine! I committed 90 straight days to finding a time to come in and freeze. I experienced the other amazing benefits outside of inflammation aid. I’ve been in Las Vegas for a week since I stopped, and I can feel the difference in my body without. I can't wait to return home to start back. I coach basketball and I’ve now turned several of my athletes on to cryotherapy, and they love the benefits as well!" I discovered "The CoolSpot Cryotherapy" over the summer when I was in tremendous pain from tendinitis in my left elbow. I am a golfer and did not want to stop playing. I had to have a solution so I could get back on the course as fast as possible. I had wanted to try Whole Body Cryotherapy since seeing it on TV, but I didn’t know where I would find one in my area until "The CoolSpot Cryotherapy" opened right around the corner from my house. When I walked in the door the staff immediately made me feel at ease and the environment was welcoming and relaxed. I had my first session followed by 15 minutes of muscle massage on the NormaTec device and I noticed the most remarkable relief with my on-going elbow pain. While in the Cryo Sauna, the cold air made the pain dissipate, however, I also experienced an amazing boost in the amount of energy that I felt for the rest of the day. That was an added bonus! I immediately bought a package for not only aiding in my elbow recovery but also for my overall health. I had no idea of ALL the benefits that Whole Body Cryotherapy & NormaTec offer my body. Energy, pain relief, and muscle recovery after a work out all contribute to an increase in my work out performance and enjoyment. I recommend this for anyone and everyone. I absolutely love The CoolSpot Cryotherapy. As a CrossFit athlete & coach- I train myself 6 days a week for 2 hours a day and coach 5 days a week being on my feet for up to 8-10 hours at a time. I thoroughly enjoy making it a point on my day off from the gym to go get the ultimate recovery here at the CoolSpot. The cryotherapy experience is awesome! It truly does flush out everything from the neck down. For me it helps reduce the delay of onset muscle soreness. However, my favorite is the Normatec. It really allows me to get that full body recovery from the compression air it uses to massage my legs and hips when my body feels wrecked. I always wake up feeling like a million bucks the next day. I send a lot of my clients here not only for the benefits of cryotherapy and normatec, but because the owners and employees here are fantastic. They are always there to answer questions on how everything works and are trying to help reach the masses on how much this does benefit everyone. From decreasing muscle soreness, pain, and inflammation to increasing energy and metabolism- this is most definitely the place for the optimum recovery." "The CoolSpot is my go to spot for recovery. The owners and personnel are top-notch and serve in a first class way. The atmosphere is clean, casual, and inviting. I have been in other cryo facilities and The CoolSpot’s machines top them all. I do believe the real benefits are felt when you go with greater frequency - 2 to 3 visits a week. I am a sports chiropractor / manual therapist and enjoy an active lifestyle outside of the office. First, I noticed a big improvement in day-to-day recovery from training and workouts. Soon thereafter, I started feeling less and less pain in joints that were regularly bothering me from my work. I recommend The CoolSpot to many of the athletes and patients I work with and to anyone else wanting to optimize recovery and accelerate healing." In 2017 I was blindsided by a rare disease that caused achy joints, muscle soreness, and severe pain, swelling and neuropathy in my hands and feet. The condition came on fairly quickly and I was scrambling to find a diagnosis and any relief. I soon realized that when you have a condition that falls outside of the standard distribution on the bell curve, the medical world becomes very hard to navigate. Two things that I now know to be true - 1. You truly have to be your own advocate 2. You’re overall health matters a lot when something goes wrong in your body. When you don’t feel good there is a strong temptation to give in and not take care of yourself. Although the last thing I wanted to do was work out and eat healthy foods, I began to notice a relationship between my symptoms and the inflammation in my body. On days when I could break a sweat, I did a little better. When I ate clean foods, I did a little better still. I found cryotherapy a few months into this journey and it was truly a game changer. I had been icing my extremities every night with ice packs but cryotherapy seemed to help a lot with systemic inflammation. I slept better on nights I did cryotherapy and I missed it badly on nights when I had skipped. I distinctly remember lying in bed one night in awful pain contemplating breaking into the Coolspot and running a session on myself at 3 in the morning. Needless to say, when I figured out the overall affect of cryotherapy on my symptoms, the folks at the Coolspot got to know me very well. My downward spiral started to switch to upward momentum. The pain wasn’t as bad so I was able to sleep a little better. The better sleep gave me more energy to work out. Working out motivated me to eat better. All of this motivated me to seek more medical answers and finally achieve the correct diagnosis and treatment. Cryotherapy was a key component in helping me through this journey. Even though I am now cured I am still doing cryotherapy regularly because I know that its good for me. I feel myself recover faster from workouts and I still can feel an overall benefit. Also the owners have hired extremely well and I enjoy going in there and seeing everybody. It’s a great break in the monotony of the work day. The Coolspot gets my highest recommendation.